What can AnyMP4 Blu-ray Toolkit for Mac do for you? With this professional Blu-ray software, you can play Blu-ray movies with a prefect audio-visual experience in your home-theatre life, you can use this Blu-ray player to rip Blu-ray to any video and audio and convert your Blu-ray files to other popular formats you want. 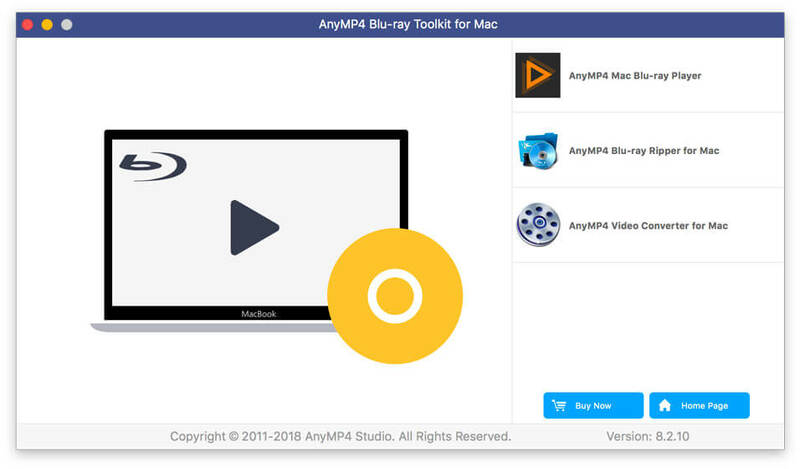 AnyMP4 Mac Blu-ray toolkit can offer you to play any Blu-ray disc and Blu-ray folder which are backed up on your local disc. Even you can watch the 1080p HD video with this Blu-ray player for Mac which can provide a perfect Audio-visual effect and the enjoyable home-theatre life. You could even use it to be as a common media player to play your non-Blu-ray movies or songs for your pleasure. Under the help of this Blu-ray ripper for Mac, you can rip Blu-ray disc to save it on your Mac as Blu-ray folder/ISO file for your easy watching. It even lets you rip Blu-ray videos to othergeneral videos like MP4, AVI, FLV, MKV, MTV, 3GP, M4V, WMV, VOB, etc. which can support to play on iPad/ iPhone, or some Android devices like Samsung, LG, Sony, Xiaomi, Huawei, HTC and so on. Furthermore, you can even rip Blu-ray to HD videos including HD MP4, HD MOV, HD MKV, DivX HD, YouTube HD, HD VOB, etc. With this Video Converter, users can convert any videos to popular videos like MP4, MOV, FLV, AVI, WMV, M4V, etc, or to prevailing audio formats like FLAC, WAV, WMA, AAC, MP3, MP2, M4A, AMR, MKA and more. So you can play it on your any player conveniently. This software can edit your videos based on your request. With the editing functions, you can adjust the effect of your video, clip video length, crop the blank edge of the video and add the watermark to the video. Statement: First, please download the orginal installation package by clicking the download link. Of course you may also download it from the publisher's website. Using AnyMP4 Blu-ray Toolkit for Mac crack, key, patch, serial number, registration code, keygen is illegal. The download file hosted at publisher website. We do not provide any download link points to Rapidshare, Hotfile, Depositfiles, Mediafire, Filefactory, etc. or obtained from file sharing programs such as Limewire, Kazaa, Imesh, Ares, BearShare, BitTorrent, WinMX etc. Software piracy is theft. If you like AnyMP4 Blu-ray Toolkit for Mac please buy it.